Liveright Publishing Corporation, 9780871403766, 384pp. When his beloved brother-in-law goes missing at the front in 1916, Angus defies his pacifist upbringing to join the war and find him. Assured a position as a cartographer in London, he is instead sent directly into the visceral shock of battle. Meanwhile, at home, his son Simon Peter must navigate escalating hostility in a fishing village torn by grief. 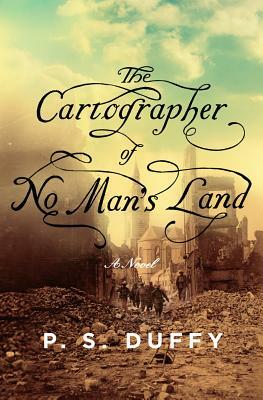 With the intimacy of The Song of Achilles and the epic scope of The Invisible Bridge, The Cartographer of No Man's Land offers a soulful portrayal of World War I and the lives that were forever changed by it, both on the battlefield and at home. What do you think “No Man’s Land” means within the novel? Is there more than one meaning? What is the importance of “No Man’s Land” in relation to the title of the book? In the beginning of the novel, Colonel Chisholm relays to Angus that he was selected to take on the role of first lieutenant due to his education and maturity. Do you think these characteristics accurately describe Angus? What other qualities prepared him for this role? Throughout the novel, chapters shift from the war to Snag Harbor. How does this technique advance the story? Is the movement between places successful? Why do you think Angus chooses not to tell Hettie that he found Ebbin? How would the truth affect Hettie? How does the secret change Angus and Hettie’s marriage? Birds are a recurring motif in the novel: the lark nesting in a German jacket, the drawing Angus makes for Paul of a lark, etc. What is the impact of these repeated images? Why does the town begin to turn on Avon Heist? Do you think he could have prevented his arrest? Are there other examples of the war bringing out unexpected behavior in characters in the novel? There are many characters that undergo personal transformations as the novel progresses. How does Simon change, and what causes these changes? What other characters experience personal growth? Why does Ebbin take on the identity of Havers? In the moment of Ebbin’s death, he calls Angus by his name. Do you think that Ebbin knows who Angus is throughout his time as Havers, or is Ebbin’s identity as Havers all-encompassing until he is faced with death? How does Hettie develop through the story? What do you make of her decision to cut her hair and work for her family? What role do Juliette and Paul play in Angus’s recovery? What do they do for him, and what does he mean to them? How does the prologue of the father and son at sea frame the novel? Were you surprised when Angus learned that Conlon had taken his own life? What about Conlon’s character may have led him to succumb? Why does Simon want to name the boat he helped design with Philip True North? Is there more than one meaning behind the name? Escape is one of many themes in the book. Identify several instances that exemplify the theme of escape. Is physical escape different from emotional escape? When Simon and Duncan examine Angus’s painting of the father and son on a boat, it quickly becomes apparent that the identities of the father and son are ambiguous. Who do you think Angus is portraying in the picture? Is it possible that there is not a concrete answer?